East Church on Washington Square North in Salem, seen from the Salem Common around 1910. Image courtesy of the Library of Congress, Detroit Publishing Company Collection. 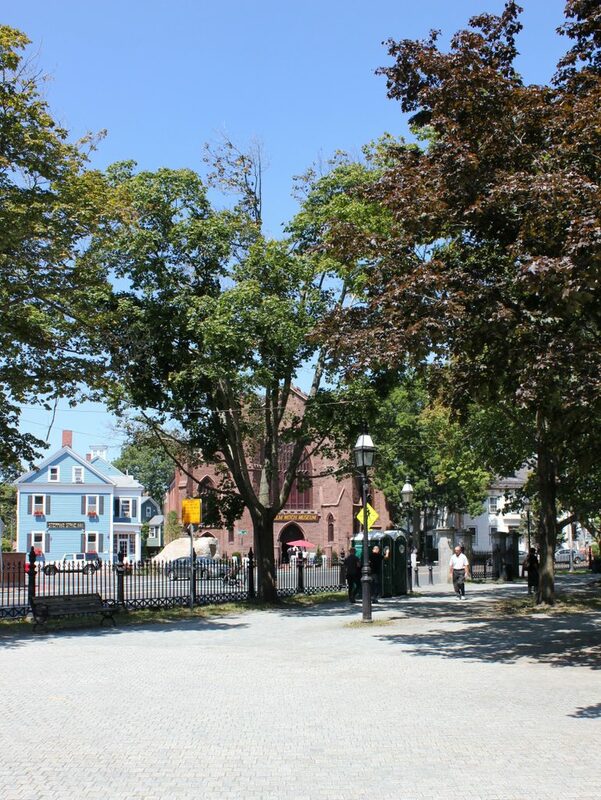 Salem’s East Church was established in 1718, when residents in the eastern part of the town left the First Church. They constructed a church building at the present-day corner of Essex and Hardy Streets, and worshiped there for more than 125 years. During this time, the church transitioned from traditional Puritan theology to, by the late 18th century, liberal Unitarian beliefs. This was largely because of William Bentley, who served as pastor from 1783 to 1819. He gained prominence as a pastor and as a journalist, regularly writing for the Salem Gazette, and Thomas Jefferson offered him a position as the first president of the University of Virginia. However, Bentley did not want to leave the East Church, and he remained there until his death in 1819. 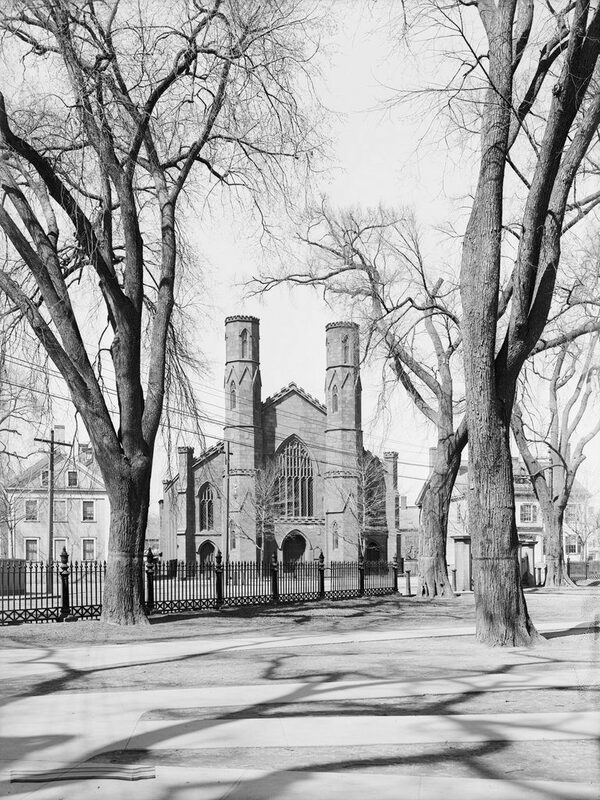 The congregation left its old building in 1846, upon the completion of this Gothic Revival-style brownstone church at the corner of Washington Square North and Brown Street, across from the Salem Common. 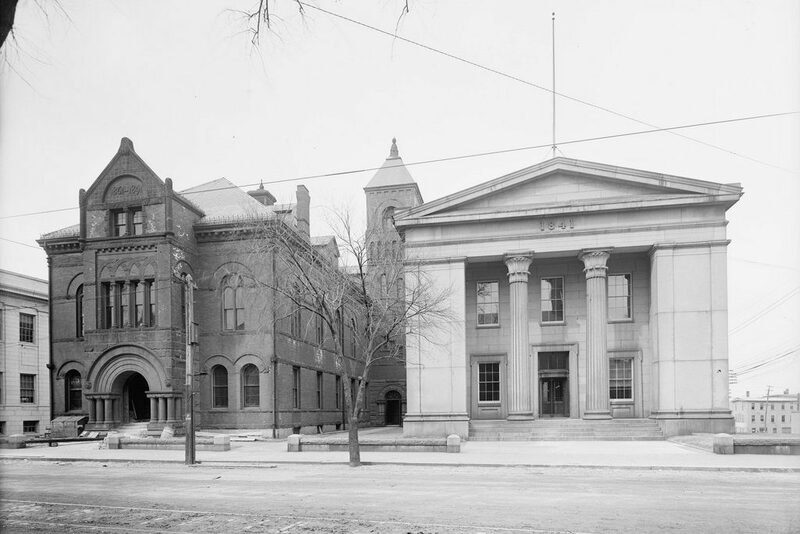 It was designed by noted architect Minard Lafever, and originally featured two tall towers at the front of the building, as shown in the first photo. Along with this, the building’s design included other distinctive Gothic elements, such as the tall, narrow windows, the pointed arches over the doorways and windows, and the crenelation along the roofline and atop the towers. In 1897, the East Church merged with the Barton Square Church and was renamed the Second Unitarian Church. The building was damaged by a fire in 1902, but it was repaired and the church continued to worship here throughout the first half of the 20th century. The first photo was taken around 1910, showing the church as it appeared after the fire, but before the towers were reduced to their present height around 1925. The church closed in 1956, following a merger with the First Church, and the two congregations were reunited nearly 250 years after their separation. No longer needed as a church, this building became the Salem Auto Museum and Americana Shops. However, another major fire in 1969 caused significant damage to the interior of the building, and destroyed much of the museum’s collections. The building was restored, though, and the interior was rebuilt to house the Salem Witch Museum, which opened here in 1972. 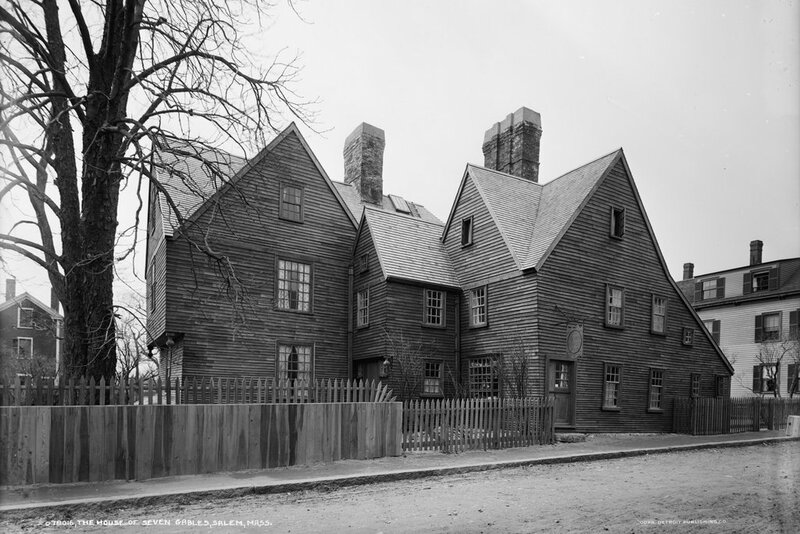 Today, the Salem Witch Museum is still located here in the building. Very little is left of the original interior, but the exterior has remained well preserved over the years, aside from the shortened towers. The houses on both sides of the first photo are also still standing, with the Abraham True House (1846) on the left, and the Captain Nathaniel Weston House (1837) on the right. 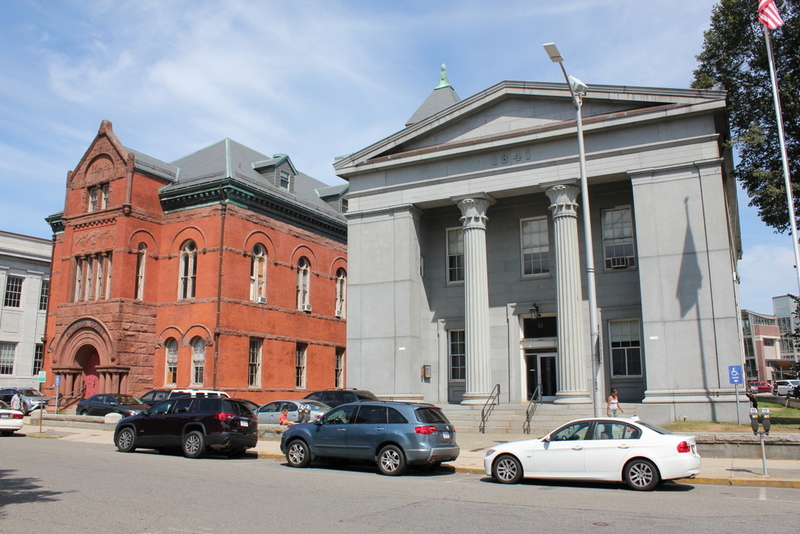 These houses, along with the church and a number of other historic buildings in the area, are now part of the Salem Common Historic District, which was added to the National Register of Historic Places in 1976. The house at 13 Washington Square West in Salem, around 1910. Image courtesy of the Library of Congress, Detroit Publishing Company Collection. This house is one of many elegant Federal-style mansions that were built in Salem in the late 18th and early 19th centuries. The period coincided with Salem’s peak of prosperity as a seaport, and many of these homes were built for wealthy merchants. One of these merchants, John Andrew, built this house here at the southwest corner of the Salem Common in 1819. It was among the finest houses built during this period, and was reportedly the most expensive private home in New England at the time. Like most other houses of the era, it has a square design, with three stories, a symmetrical front facade, and a hip roof that is partially hidden by a balustrade. However, it also has other decorative features that make it stand out from similar homes, including the decorative front porch, the Palladian window above it, and the four large columns on the left side. 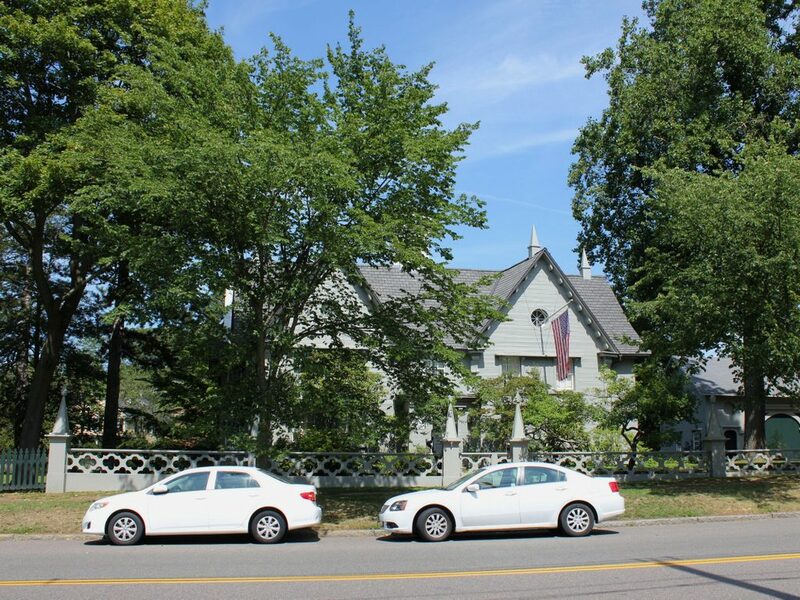 The house is also situated on a relatively large lot for downtown Salem, and the property includes a garden on the left side and a stable on the right. John Andrew’s wealth had come through the Russian fur trade, but he subsequently fell on hard times after building this house. By the time he died a decade later, in 1829, he was in considerable debt. However, the house would remain in his family for many years, and his extended family continued to be prominent. 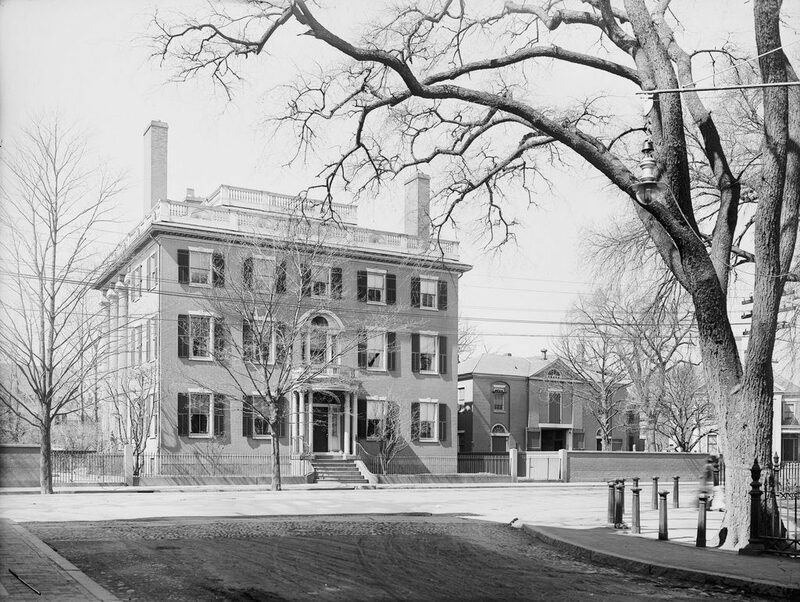 His nephew, John A. Andrew, who often visited this house, went on to become governor of Massachusetts from 1861 to 1866, and Governor Andrew’s son, John F. Andrew, served two terms in Congress from 1889 to 1893. The Andrew family sold this house in 1860, and it went through several ownership changes before being purchased by James O. Safford in 1871. 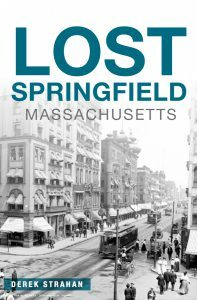 Safford was a leather merchant, and his business interests also included serving as a director of the North Bank of Boston and the Naumkeag Steam Cotton Company. Along with this, he was elected to the city council for four consecutive years, serving from 1865 to 1868. During the 1870 census, which was taken shortly before he purchased this house, he had real estate valued at $10,000, with a personal estate of $8,000. By the 1880 census, Safford was living here in this house with his wife Nancy, their teenaged children William and Elizabeth, and three servants. He died three years later, at the age of 63, followed by Nancy a decade later in 1893. Their children inherited the property, though, and the 1900 census shows both William and Elizabeth at the house. Elizabeth was married by this point, and lived here with her husband, McDonald White, and their two young children, Elizabeth and Osborne. The family also employed four most of them Irish immigrants, who lived here in the house. The family was still living here when the first photo was taken around 1910. At the time, William Safford was a real estate broker, while McDonald White was a manager for the Houghton Mifflin Company. However, White was killed in a car accident in 1916, and Elizabeth’s two children moved out of the house sometime during the 1920s. Both the 1930 and 1940 censuses show Elizabeth and William living alone in the mansion except for a single servant, and they died a year apart in 1946 and 1947, after having lived in this house for nearly their entire lives. After Elizabeth’s death in 1947, the house was acquired by the Essex Institute. 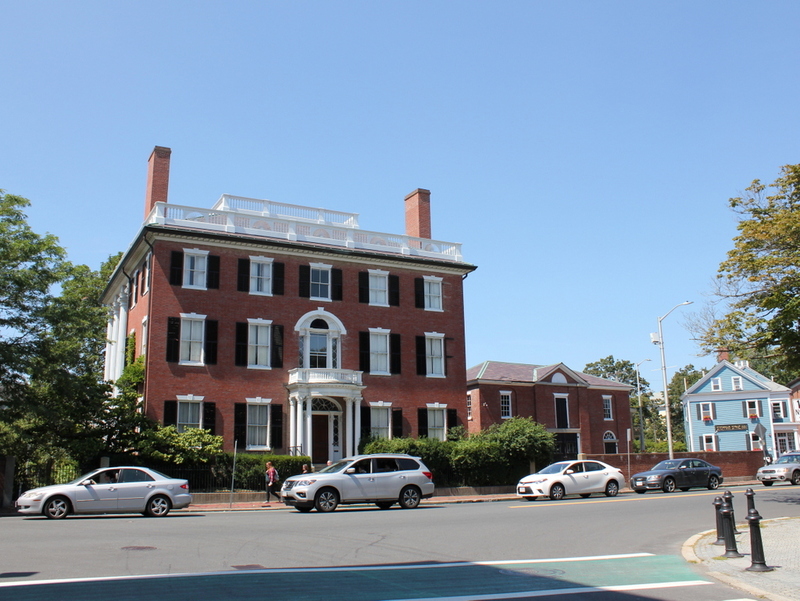 For many years, the house served as the home of the museum director, and today it is owned by the Peabody Essex Museum, which was formed after the 1992 merger between the Essex Institute and the Peabody Museum of Salem. The Andrew-Safford House is one of many historic houses owned by the museum, and it is also a part of the Essex Institute Historic District, which was added to the National Register of Historic Places in 1972. The House of the Seven Gables, seen from Turner Street in Salem, around 1890-1901. Image courtesy of the Library of Congress, Detroit Publishing Company Collection. The house around 1910-1920. Image courtesy of the Library of Congress, Detroit Publishing Company Collection. This house is best known for being the inspiration for Nathaniel Hawthorne’s 1851 novel The House of the Seven Gables, but it is also one of the oldest houses in the state, as well as one of the finest surviving 17th century homes in New England. The house has seen considerable changes over the past 350 years, and today the exterior bears little resemblance to the house that Hawthorne would have known, but it was originally built in 1668 as the home of John Turner. At first, the house consisted of just the central portion of the present-day structure. However, like many other colonial-era houses, it steadily expanded over the years, giving the house its distinctive appearance. Born in Boston in 1644, John Turner moved to Salem as a child, after his father died and his mother remarried to a wealthy Salem merchant. Turner likewise became a merchant as well as a mariner, with a career that coincided with Salem’s rise to prominence as a major seaport. He built the first section of this house around the same time as his marriage to Elizabeth Roberts, but over the years the house was expanded as both the family and Turner’s fortune grew. The southern part of the house, seen on the left side of the photos, was added in 1677. This wing included a parlor, and increased the size of the house by nearly two thirds. By this point, Turner was among the wealthiest men in Essex County. He owned five ships, with ownership interests in eight others, and had a net worth of nearly 7,000 pounds. However, he died in 1680, when he was only about 36 years old. Turner’s son, John Turner II, was only about nine years old at the time of his father’s death, but he later inherited the house. He was also a merchant, and eventually accumulated an even larger fortune than his father, with an estate of over 10,000 pounds when he died in 1742. Along with this, he held the rank of colonel in the militia, and served on the Governor’s Council from 1720 to 1740. He made his own changes to the house, including remodeling the interior to reflect the Georgian style of the early 18th century. The house had 14 rooms at the time, and the highly complex roofline featured eight gables, as opposed to the seven that the house is best known for. As a young man, Turner also played a role in the Salem Witch Trials, which occurred in 1692. He did not make any accusations himself, but one of the accusers, John Proctor’s servant Mary Warren, claimed that the elderly widow Ann Pudeator had bewitched Turner, causing him to fall from a cherry tree. This was one of several accusations made against Pudeator – including a claim that she had turned herself into a bird and flew around her house – and she was subsequently convicted of witchcraft and hanged. After John Turner’s death in 1742, the house was inherited by his son, John Turner III. However, he evidently did not inherit the business acumen of his father and grandfather, and over the years he squandered the family fortune. Believing the family home was too old-fashioned, he built a modern house near the center of Salem. 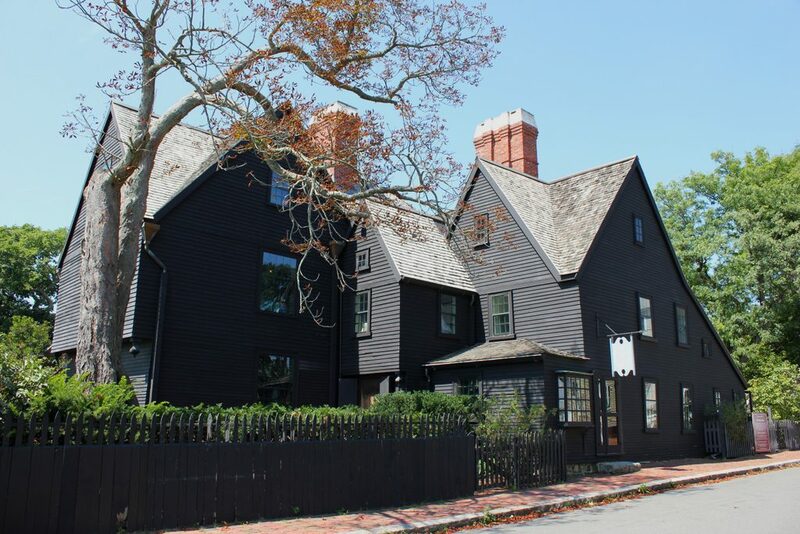 However, he eventually fell into debt, and in 1782 was forced to sell all of his property, including the House of the Seven Gables, in order to pay off his creditors. He died four years later, leaving an estate of just 59 pounds. Turner sold this house to Samuel Ingersoll, a ship captain who lived here with his wife Susanna and their children. One of the eight gables had already been removed at this point, and Captain Ingersoll proceeded to remove four more, leaving the house with just the three gables that are shown in the first photo. He lived here for the rest of his life, although he was frequently away on long sea voyages. In 1804, during one of these voyages, both he and his oldest son died of a fever aboard ship. Susanna died seven years later, and the house was inherited by their only surviving child, a daughter who was also named Susanna. Susanna never married, and went on to live in this house for the rest of her life. She was a second cousin of fellow Salem native Nathaniel Hawthorne, who had been born a short walk from here on Union Street in 1804. The extent to which she and the house served to inspire Hawthorne is still debated, but he did occasionally visit Susanna here, where she told him stories about the house’s history. She also showed him the attic, where there was still visible evidence of the long-removed gables. Hawthorne never explicitly stated that this house was the basis for The House of the Seven Gables, but it seems likely that he drew inspiration from its history and from Susanna herself. The novel traces the history of the fictitious Pyncheon family, whose founder, Colonel Pyncheon, had acquired the land after the previous owner, Matthew Maule, had been executed for practicing witchcraft. Before his death, though, Maule had placed a curse on the Pyncheon family, and the Colonel died suddenly on the day that the house was completed. In the present day of the novel, the house was owned by one of his descendants, the impoverished Hepzibah Pyncheon. She was an older unmarried woman, likely based on Susanna Ingersoll, and she opened a shop on the ground floor of the old house in order to supplement her income. The novel was published in 1851, and Susanna continued to live here in the real-life house until her death in 1858. She had no biological heirs, but she left the house to her adopted son, Horace Connolly. He sold it in 1879, and the house changed hands several different times before being purchased by Henry Orlando Upton in 1883. He and his family were living here when the first photo was taken around the end of the 19th century, and by this point the house had become a popular tourist attraction, even though its exterior bore little resemblance to the house described in Hawthorne’s novel. 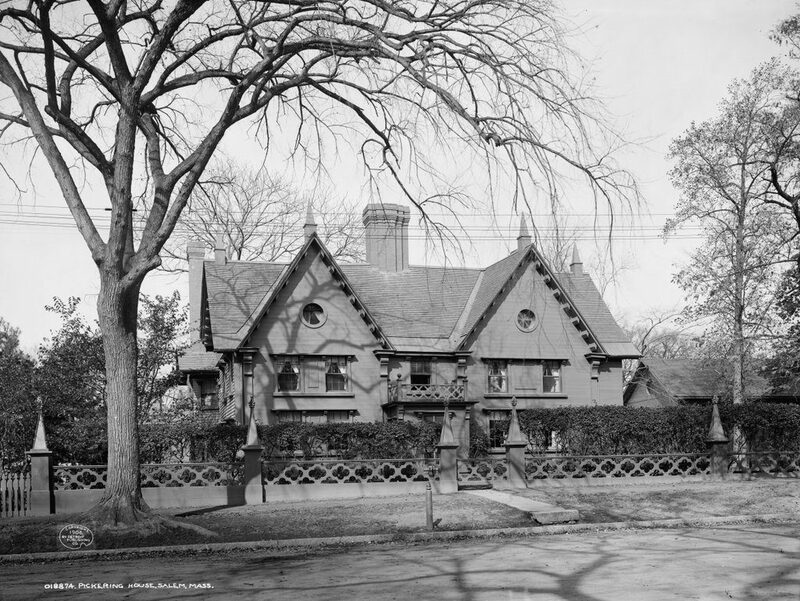 In 1908, Upton sold the house to Caroline O. Emmerton, a philanthropist who wanted the house returned to its original appearance and preserved as a museum. She hired noted architect Joseph Everett Chandler for the restoration, which lasted from 1909 to 1910. The second photo shows the completed work, which included the reconstruction of the missing gables, as well as a new chimney on the right side that was based on the original 1668 chimney. The exterior was restored to what the house supposedly looked like during the ownership of John Turner II in the 1720s, although some of the changes were made to match Hawthorne’s novel, rather than its actual historic appearance. Today, the exterior of the house looks essentially the same as it did when Chandler finished his restoration over a century ago. It remains in use as a museum, and has since been joined by several other historic buildings that were moved to the property, including Hawthorne’s birthplace. These buildings now comprise the House of the Seven Gables Historic District, which was designated as a National Historic Landmark district in 2007. The Pickering House, at 18 Broad Street in Salem, around 1906. Image courtesy of the Library of Congress, Detroit Publishing Company Collection. 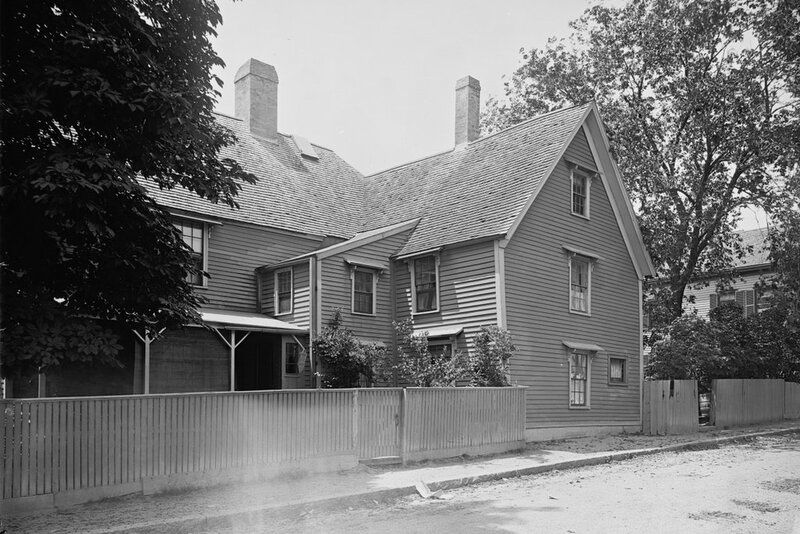 Although it is hard to tell from its current appearance, the Pickering House is one of the oldest existing buildings in Massachusetts, and possibly the oldest in Salem. According to tradition, it was built around 1651 by John Pickering, Sr., who died in 1657. However, recent dendrochronological dating suggests that the house was actually built around 1664, presumably by Pickering’s son, who was also named John. Originally, the house consisted of just the eastern portion on the right side of the house, with one room on each of the two stories, but it was expanded and altered many times over the years. The first probably came around the 1680s, when John Pickering, Jr. added the western part of the house on the left side. Pickering was a farmer, as were most of the other residents of Salem during this period, but he also held several town offices, including serving as a selectman, constable, and militia officer. He held the rank of lieutenant during King Philip’s War, and fought with distinction at the Battle of Bloody Brook in Deerfield in 1675. He lived in this house until his death in 1694, at the age of 57, and he left the property to his oldest son, John. The house itself would continue to be altered and expanded over the years, but it would remain in the Pickering family for more than three centuries. Probably the most notable of John Pickering’s ancestors was his great-grandson, Timothy Pickering, who was born here in this house in 1745. He was the son of Deacon Timothy Pickering, who had inherited the property after the death of his father, the third John Pickering, in 1722. The younger Timothy was a 1763 graduate of Harvard, and subsequently became a lawyer and a militia officer. He was involved in the February 26, 1775 confrontation in Salem, later known as Leslie’s Retreat, which marked the first armed resistance to British rule in the colonies, and he later participated in the Siege of Boston from 1775 to 1776. By this point, Pickering held the rank of colonel, and in 1777 he was appointed adjutant general of the Continental Army. From 1780 to 1784, he served as quartermaster general of the army, and after the war he moved to Pennsylvania, where he served as a delegate to the state convention that ratified the United States Constitution in 1787. Under President George Washington, Pickering negotiated several treaties with Native American tribes during the early 1790s, and in 1791 Washington appointed him to his cabinet as Postmaster General. He held this position until 1795, when he was appointed Secretary of War, and later in that same year he became Secretary of State. Pickering remained Secretary of State throughout the rest of Washington’s second term, and for most of John Adams’s presidency. However, he and Adams disagreed on foreign policy, particularly on how to address growing tensions with France. Pickering favored war with France and an alliance with Britain, while Adams preferred negotiation with France, and Pickering became increasingly vocal in his opposition to the president’s policies. Adams finally demanded his resignation, but Pickering refused, so Adams dismissed him in May 1800. After nearly a decade in the cabinet, Pickering was elected as a U.S. Senator from Massachusetts in 1802. By this point, Thomas Jefferson had been elected president, and Pickering became an outspoken critic of both Jefferson and the south as a whole. He lost his re-election bid in 1810, but two years later was elected to the House of Representatives, serving two terms from 1813 to 1817. His first term coincided with the War of 1812, which he and many other New Englanders were strongly opposed to. Believing that the war would hurt the region’s trade-based economy, Pickering was among those who advocated for northern secession from the union, although no serious movement ever came of this. After his second term, Pickering retired to Salem, where he died in 1829 at the age of 83. In the meantime, this house continued to undergo changes by successive generations of the Pickering family. At some point around the 1720s, a lean-to had been added to the rear, and in 1751 Deacon Timothy Pickering raised this to two stories. However, the single most dramatic change to the house’s exterior appearance came in 1841, during the ownership of Colonel Timothy Pickering’s son, John Pickering VI. He transformed it into a Gothic Revival-style house, adding most of the decorative elements that now appear on the front facade, including the cornice, brackets, roof finials, and round windows in the gables. He also added the barn on the right side of the photo, as well as the fence in front of the house. Over the next 150 years, the house remained in the Pickering family. Most of these descendants were also named John, and they made their own alterations to the house. Much of the interior was remodeled in the mid-1880s, and the central chimney was also rebuilt during this period. Then, in 1904, the enclosed front porch was added to the front of the house, as shown in the first photo only a few years later. Since then, the front facade has not seen any significant changes, although the interior underwent restoration in 1948. By the late 20th century, the house was believed to have been the oldest house in the country that was continuously occupied by the same family. However, in later years the house was also open to the public as a museum, and the last members of the Pickering family finally moved out in 1998. Today, the house is still a museum, run by the Pickering Foundation, and it is also rented as a venue for a variety of events. Along with the other houses in the neighborhood, it is now part of the Chestnut Street Historic District, which was added to the National Register of Historic Places in 1973. Looking north across the bridge over the North River in Salem, around 1895-1905. Image courtesy of the Boston Public Library. 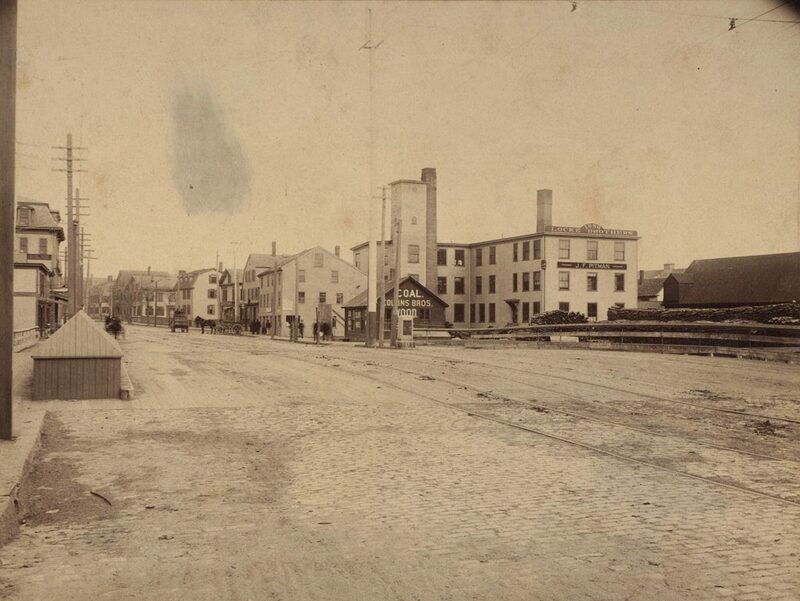 More than a century before the first photo was taken, this scene on North Street in Salem was the site of Leslie’s Retreat, a confrontation that is said to have been the first armed resistance to British rule in the American colonies. The event occurred on February 26, 1775, less than two months before the more famous battles at Lexington and Concord, and was the result of a British effort to seize cannons that were stored in a blacksmith’s shop on the north side of the river. 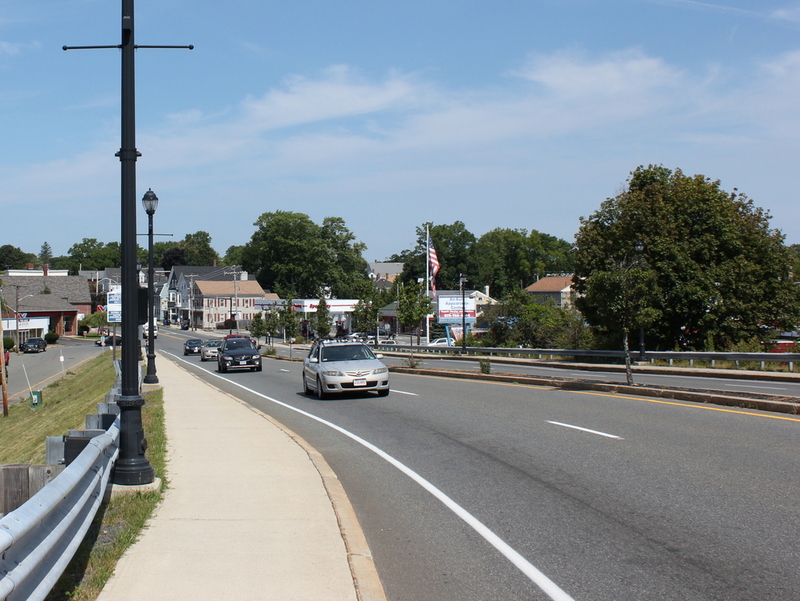 On that day, some 240 British soldiers, under the command of Lieutenant Colonel Alexander Leslie, landed in Marblehead and subsequently marched through Salem on their way to the North Bridge. However, by the time they arrived at the south side of the river, the town’s militia had already assembled here, and the drawbridge span had been raised to obstruct their path. Colonel Leslie demanded that it be lowered, and even threatened to open fire if it was not, but the militia stood their ground, their ranks swelled by a growing crowd that shouted insults at the British soldiers. At one point during the long standoff, the British made an attempt to seize several boats in the river. However, the locals noticed this, and began smashing the bottoms of the boats before the British could reach them. During the ensuing struggle, the soldiers threatened the men with bayonets, but one Salem man, Joseph Whicher, opened his shirt and dared them to stab him. One soldier obliged, lightly pricking him in the chest with his bayonet. It was enough to draw blood, making it arguably the first American blood spilled during the Revolution. As dusk approached, Leslie realized that the situation was hopeless. He finally reached a compromise with the militia, and was allowed to cross the bridge if he agreed to proceed no further than the blacksmith shop. Everyone on both sides knew that the cannons were long gone by this point, having been removed to a more secure location, but the deal allowed Leslie to save face by technically carrying out his orders. He duly performed a cursory search of the blacksmith shop, found no cannons, and then he and his men marched back to their ship in Marblehead, escorted by local militiamen from all of the surrounding towns. By the time the first photo was taken, the scene had changed significantly from its 18th century appearance. 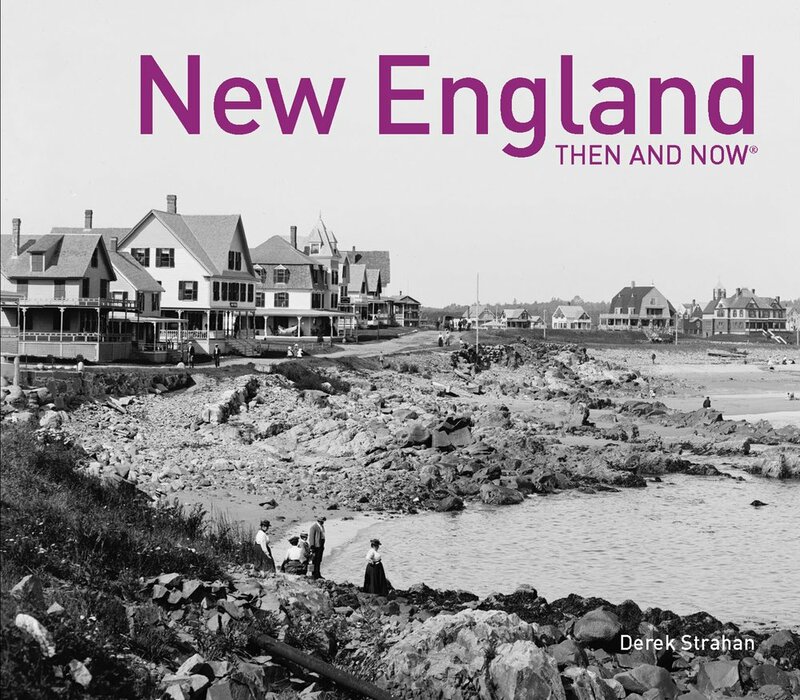 Salem was no longer the prosperous seaport that it had been in the years immediately after the American Revolution, and much of this area along the North River had been developed for industrial use. A few of these industries are visible on the right side of the photo, including the Locke Brothers company, which produced steam fittings in the large three-story building near the foreground. In front of this building is a one-story building that housed the offices of the Collins Brothers coal company, and the coal shed is partially visible on the far right side of the photo. Today, this scene is essentially unrecognizable from the first photo. Not only are most of the 19th century buildings gone, but the road itself has been completely rebuilt. The river, once been an impassable barrier for the British soldiers, is now hardly even noticeable for modern drivers. However, there are several buildings that appear to survive from the first photo, including one that was likely standing during the events of February 26, 1775. Located at 98 North Street, directly opposite Mason Street, this three-story gambrel-roofed house is barely visible in the distance of both photos, at the point where the road curves out of view. It is now heavily modified from its original appearance, with a storefront occupying part of the ground floor, but it was probably built between 1750 and 1770, making it old enough to have been here when the Leslie’s Retreat occurred.